This week the Mayor and Mayoress of Brighton and Hove, Councillor Brian and Mrs Norah Fitch, joined members of the Brighton and Hove branch of Guide Dogs, who teamed up with staff from Brighton and Hove Bus Company to embark on a training day. The aim of the training was to give staff not only an insight into life as a visually impaired person, but also to raise awareness of the difficulties faced by visually impaired people when using public transport. 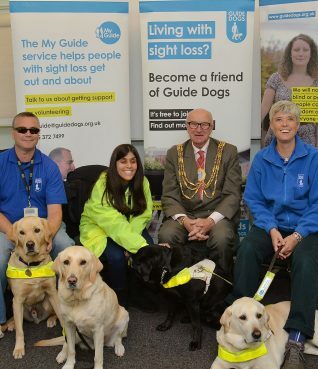 The Guide Dogs team hoped to increase drivers’ awareness and advise on how they can make simple changes to help visually impaired passengers. For instance, announcing when the bus has arrived at the passengers’ desired stop, and not setting off until everyone is seated. Hopefully the training will mean better service and allow visually impaired people to feel safe and confident in using Brighton and Hove buses in the future.